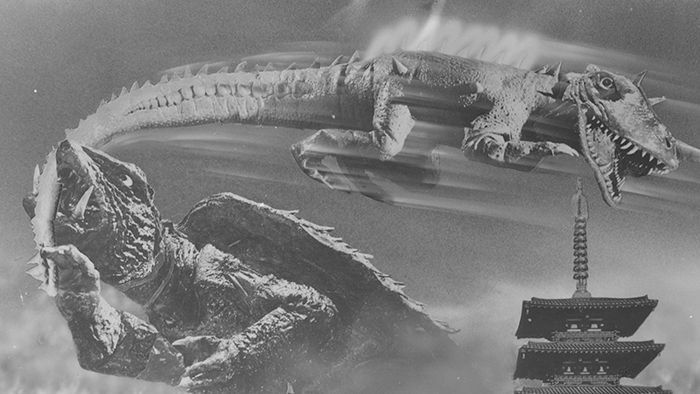 War of the Monsters (1966) Review – AiPT! Also known as Gamera vs. Barugon, War of the Monsters is the second installment in the Showa era Gamera series and a mostly superior follow-up to the first film, Gammera the Invincible (no, that’s not a typo). War of the Monsters gets us one step closer to the more iconic era of the giant turtle’s Showa adventures, but still isn’t quite the Gamera we recognize. While Gamera’s first opponent, Barugon, is wonderfully silly (and his enemies would only proceed to get sillier), the film lacks the in-your-face sense of goofy fun that the next installments would harbor, taking everything pretty seriously regardless of how ridiculous a giant rainbow-blasting iguana is. And Gamera has still yet to become a friend to children everywhere. Hrmph. Pilot/adventurer Keisuke (Kojiro Hongo) has traveled to a remote part of New Guinea to search for a giant opal worth a fortune. After the opal is stolen by the treacherous Onodera (Koji Fujiyama), the opal is unwisely left unattended beneath an infrared heat lamp. This is unwise because the opal is actually an egg and the infrared rays not only allow the mythical monster called Barugon to hatch, but enlarge him to tremendous size as well! Admittedly, things aren’t looking too good for the people of Japan, that is, until Gamera (Teruo Aragaki) returns from his banishment in outer space, ready to rumble. While hints of Gamera’s affection for children were dropped in Gammera the Invincible, such notions are completely ignored with this sequel. In fact, there are no kids in the cast whatsoever; an anomaly for the Showa era Gamera series. While the big turtle loses that dimension to his character, he does manage to gain an omnipotent narrator who follows him around wherever he goes, explaining his actions to the audience (who would be rightfully confused without it, really). Gamera’s foe is the hilariously weird Barugon, a giant spiky iguana-thing with a long barbed tongue that shoots a freezing mist. What with Gamera being a monster who runs on fire, Barugon is his natural opposite. Lashing tongue and freezing breath aren’t why Barugon is awesome, though. No, Barugon is awesome because when the spikes on his back light up, he emits a super-destructive rainbow across the landscape. That’s right, a rainbow. Since this movie takes itself so seriously, you have military tacticians and accomplished scientists having lengthy discussions on how they intend to defeat Barugon’s deadly rainbow. Just try not to laugh. At 101 minutes, War of the Monsters is a bit too long for its own good. The long stretch of monster-free time at the beginning is pretty excruciating, and Gamera hardly seems to be in the movie at all. To the flick’s credit, the fight between Gamera and Barugon is surprisingly well done, with the two exceedingly weird kaiju using their exceedingly weird powers on one another. It’s all very surreal. The best scene in the movie, however, does not even feature Gamera. It features Barugon snatching Onodera with his tongue and gobbling him up. Believe me, it f-----g rules.